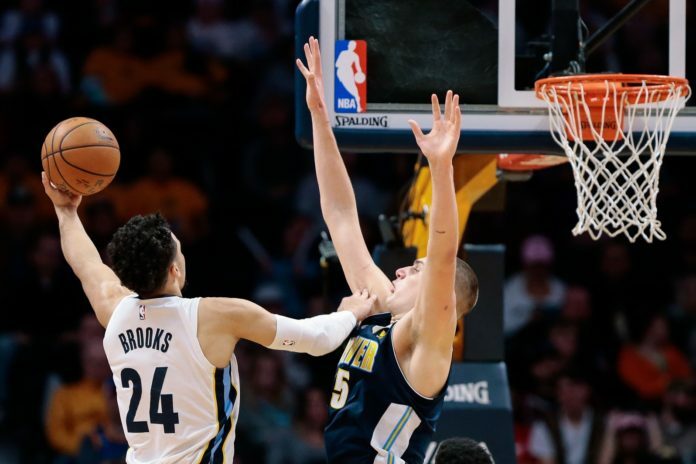 The Denver Nuggets hosted an improving Memphis Grizzlies squad on the Pepsi Center floor in downtown Denver on Friday night looking to snap a three-game losing streak. Unfortunately, Denver was without their star shooting guard Gary Harris, who was back home in Indiana due to undisclosed personal reasons, but Denver still managed to hang on to secure the win over the Grizzlies by a score of 87-78. The first quarter showed how badly the Nuggets’ missed Harris. In the first six minutes of the first quarter, Denver hit just two shots — both by Wilson Chandler — and accumulated just eight points. After a 15-0 run from the Grizzlies, the Nuggets found themselves down 23-8 after the first nine minutes of the first quarter. There was no energy on the floor for Denver as the Grizzlies continued to blitz them in transition off of every one of the (many) Nuggets’ missed shots. Considering that the Nuggets were coming off one of the worst losses of the year at the hands of the Atlanta Hawks, it was incredible seeing how flat the Nuggets were to start their game. Nuggets’ head coach Michael Malone was desperate early so he turned to Kenneth Faried and Richard Jefferson to try and calm things down, which should tell you everything you need to know about how badly the first quarter went. Thankfully, Trey Lyles and Malik Beasley were able to get back to back buckets to start Denver 5-0 run that helped close the first quarter gap to just 26-16 after trailing by as many as 15 points. The momentum gained at the end of the first quarter carried over to the start of the second frame as Denver jumped out to an 11-4 run. What made things interesting is that the Nuggets went on their run with the infamous front-court combination of Faried and Jokic. Faried’s energy was infectious and was a large reason why the Nuggets climbed back into the game. Finally, Barton hit his first three of the game to tie the game at 38 apiece. Denver had finally started playing closer to their talent level, but there was still an urgency that lacked. Denver went into halftime down 47-43 to the Grizzlies. The third quarter was still an ugly performance — as was much of the first half — but the Nuggets came into the frame looking for blood as Denver went on a 15-7 run to finally take a lead versus Memphis. While Denver held onto the lead throughout most of the third quarter, the big reason why was because of Beasley. His energy, three-point shooting, tenacious defense, and athleticism shined bright as the Nuggets saw their lead grown to a game-high of seven points. The Nuggets carried a lead of 67-60 as they headed into the fourth and final quarter. The fourth quarter was back and forth between the Grizzlies and Nuggets but Denver was able to hold on thanks to the inspired play of Beasley — who continued to fly around everywhere and impacted the game in nearly every facet. He was not especially efficient, but the proof is in the stats; Beasley was a +19 in 23 minutes of action in a game that was decided by just nine points. Denver eventually held on to secure the victory over the Grizzlies by a score of 87-78 and snapped their three-game losing streak. Denver improves to 22-20 on the year and holds onto the seventh-seed in the Western Conference playoff race. They will now travel to San Antonio to take on the Spurs on Saturday night for the second game of a back to back attempting to start another winning streak.